• Faucet: Both Are White Single Lever Euro Style, Main Sink Has White Water Filter Faucet to the Left of the Main Faucet. The Filter under the Sink Is Also Connected to the Water and Ice in the Fridge. 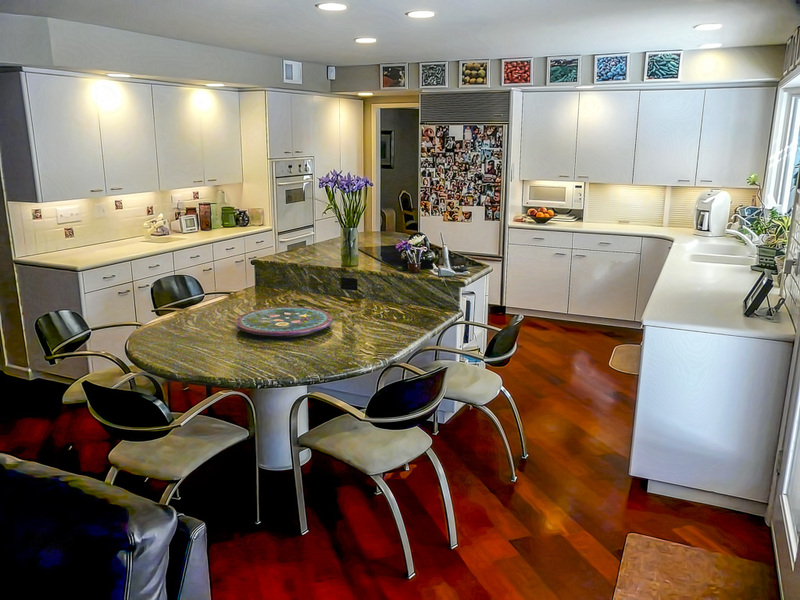 This clients main objective was to increase the functionality of the kitchen area as a whole and make it the focal point of activity for their young family while also creating a better physical and visual connection between the kitchen, family room, and patio/ pool area. 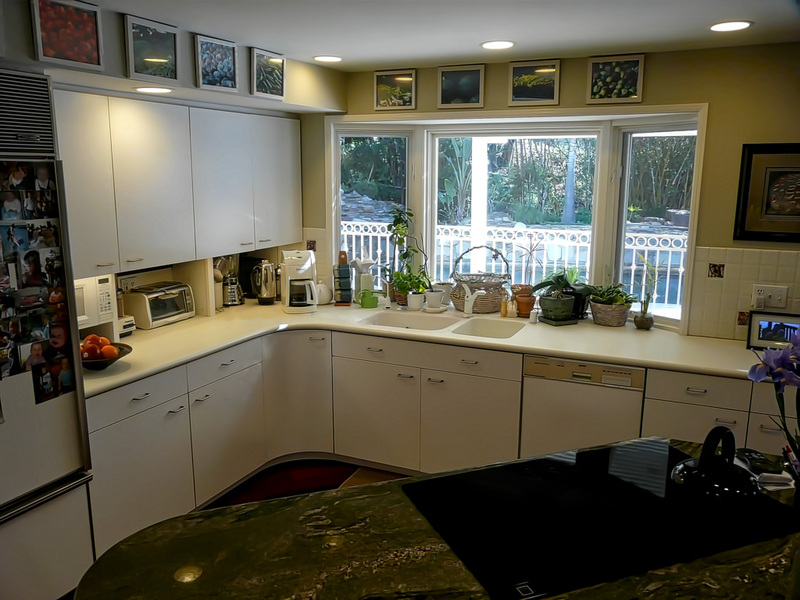 The original kitchen had a U-shape at the windows with wall cabinets separating the kitchen from family room and a straight run of cabinets where the prep sink and ovens are now. 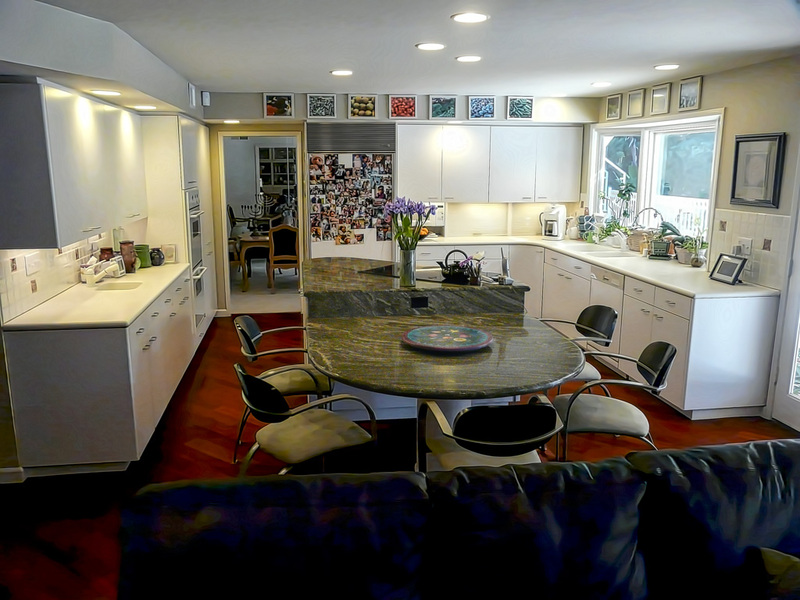 That plan was relatively functional, but the breakfast seating area was in a straight line facing the kitchen and could barely seat 3. Those straight-line eating bars do not lend themselves well to communication and interaction, as you do not face anyone sitting there with you. 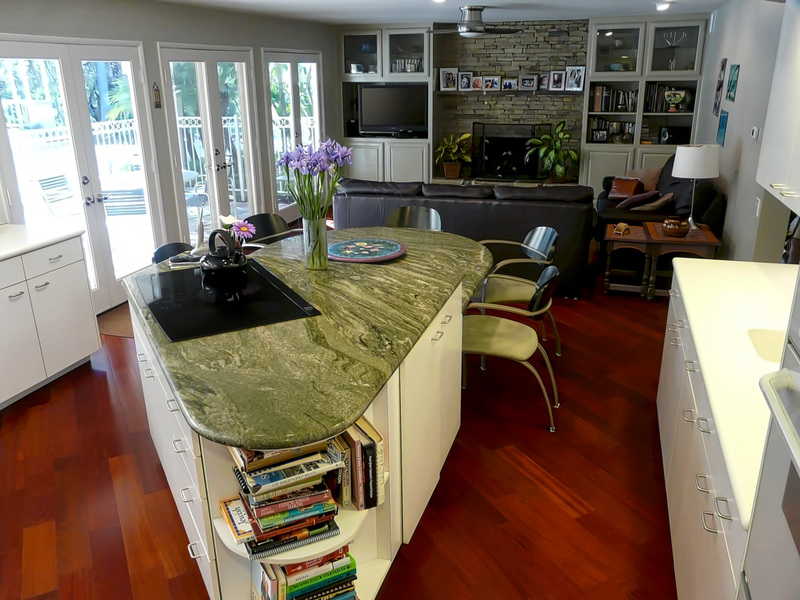 The kitchen was big enough to add an island and also attach a full table that comfortably seats 5, all facing one another. Far more accommodating for a family of 5 and encouraging communication and interaction. 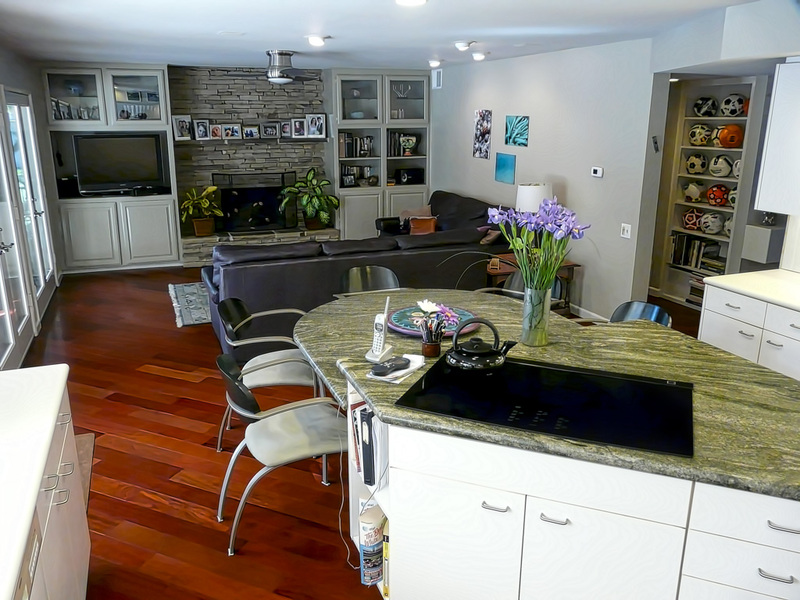 All but one person sitting at the table can also easily see the TV in the family room while sitting there. 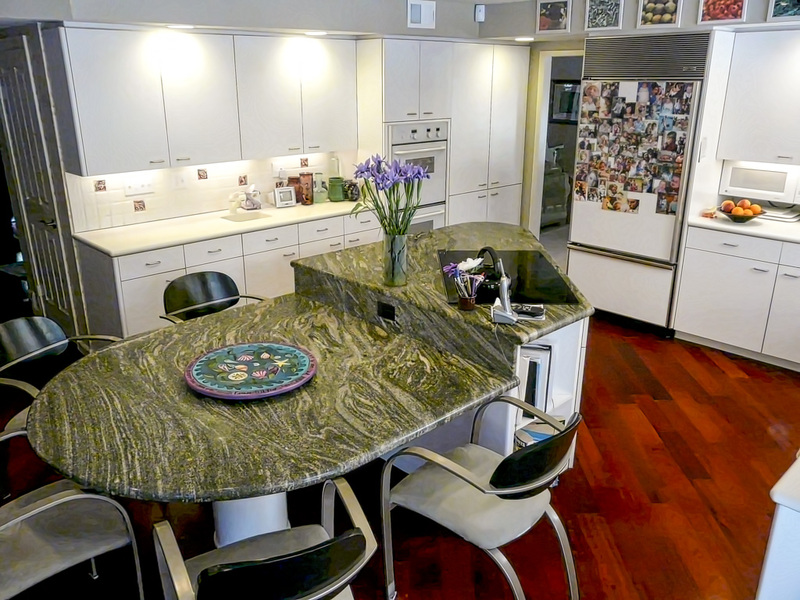 The island countertop and specifically the colorful green granite chosen for it, became the center piece for this room. Notice how the island takes on an unusual shape. 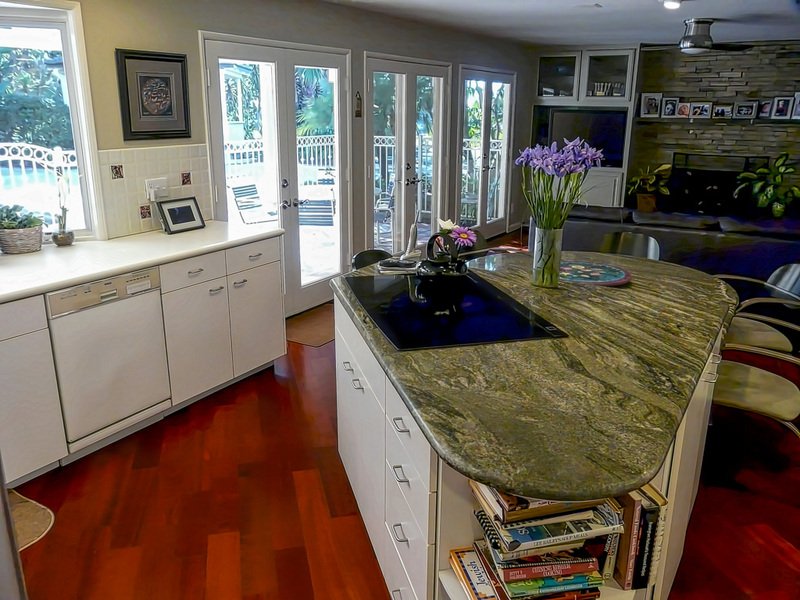 I have always suggested to put island cooktops at an angle because it leaves the main L-shaped work area more open, in turn providing more floor space to maneuver so that more than one person can work in the kitchen at the same time. 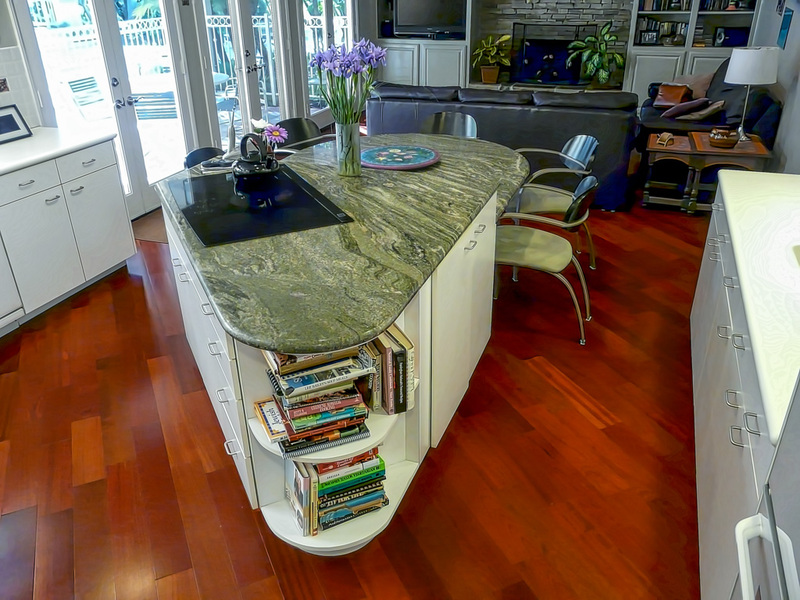 That angle also gives the island an unusual shape that augments its secondary purpose as a visual focal point for the room. 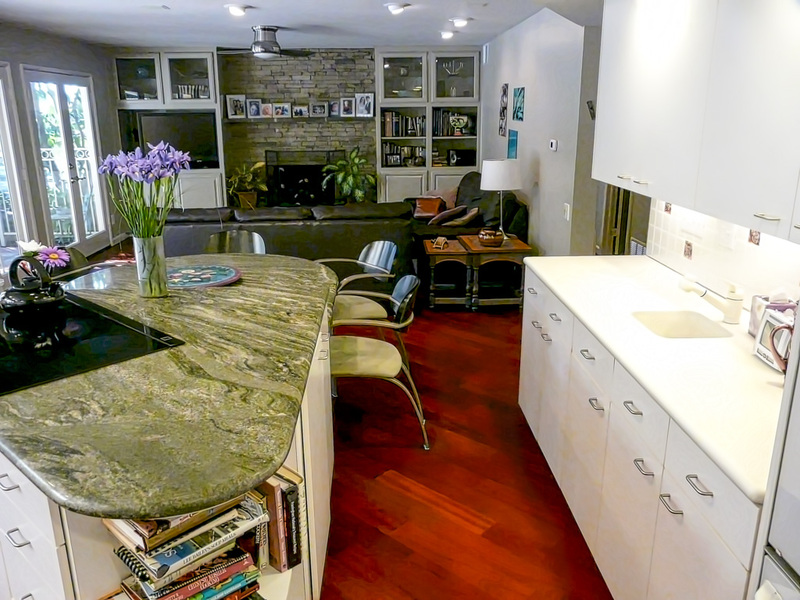 Imagine this kitchen having a rectangular island — on which side would you put the cooktop? 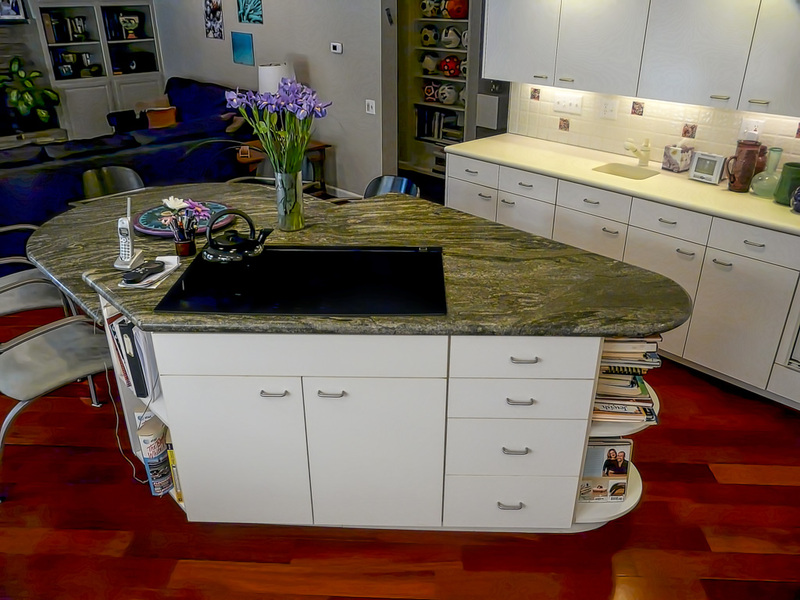 Whichever you ended up choosing, you would constantly have to walk around corners to move between the refrigerator, cooktop, and sink, which would be all the more frustrating if others are in the kitchen and in your way. Hardly an ideal solution for a family of 5. 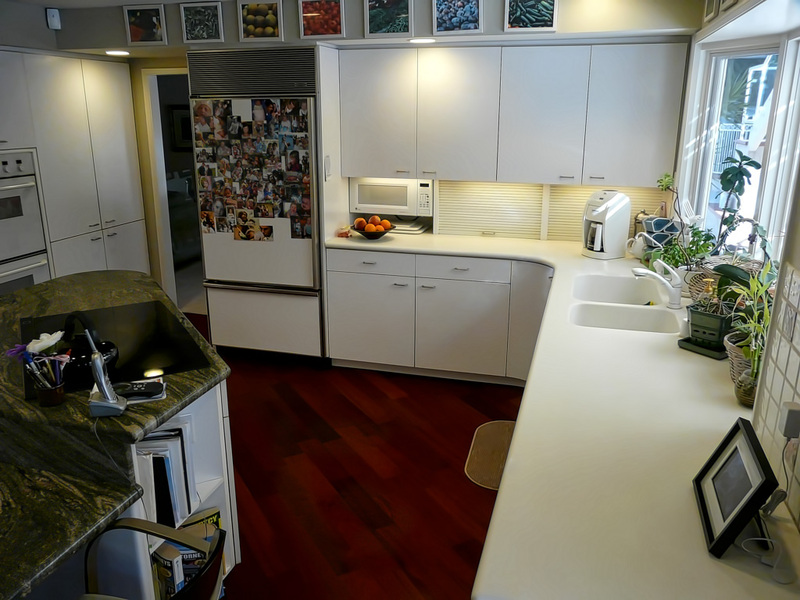 Simple white cabinets with flat laminate doors were chosen by the client to save money, but also to have a long-lasting cabinet material. We added one curved door in the corner and used post-formed rolled edges on the panels we applied to all the finished ends to give them and the room a softer feel. The wall of the L-shape between the sink and fridge has the microwave attached to the wall cabinets to get it up off the counter. It also has two large appliance garages with roll top doors to keep many of their appliances out of sight when not in use. 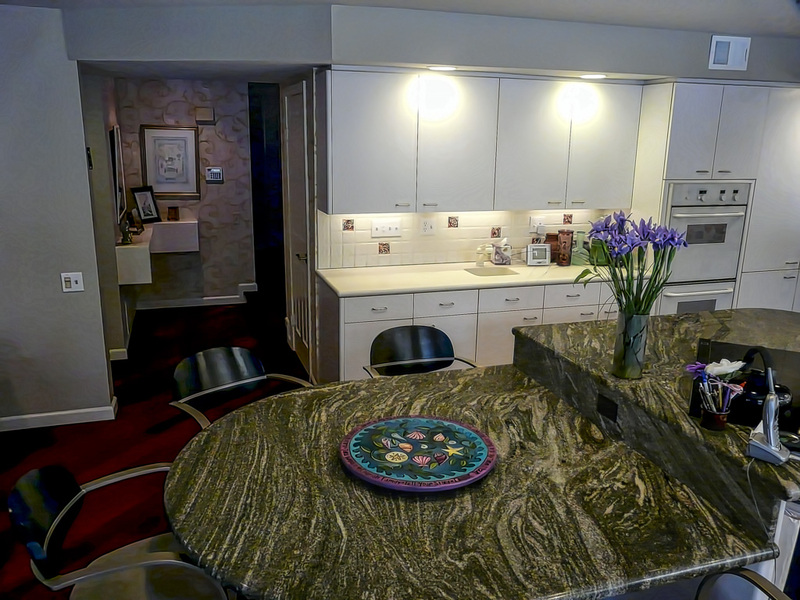 If you look closely, you can see we made the wall cabinets there 18″ deep, 6″ deeper than normal so we could fit under cabinet lighting in that spot in spite of having the appliance garages which were kept at the normal 12″ depth. Details do make a difference in aesthetics as well as function. 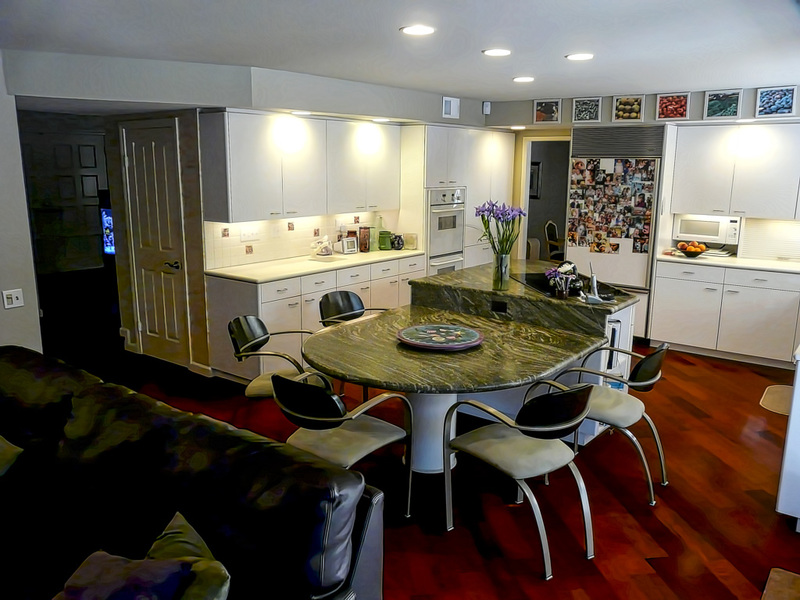 These pictures were actually taken over two decades after the project was done, they originally had a wood parquet floor that we patched and matched originally. 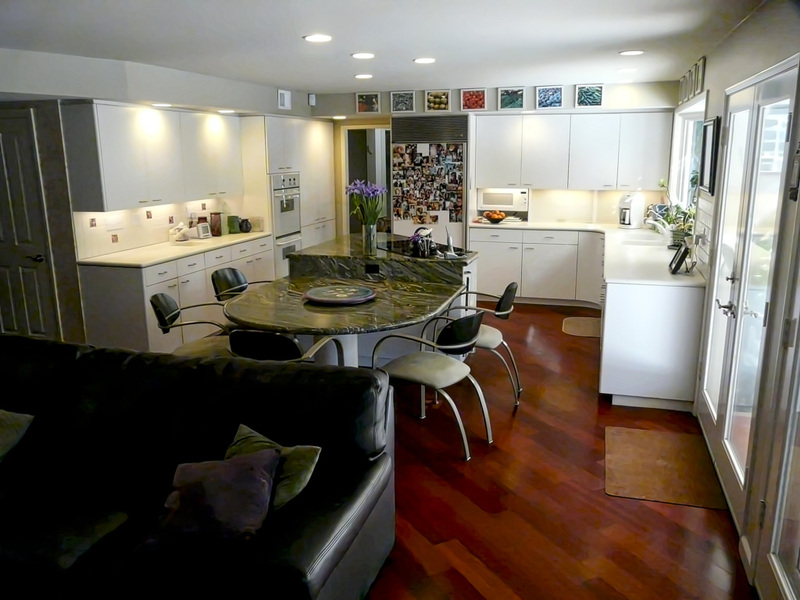 Then in conjunction with a bath and office remodel we did many years later, they changed the floors to the gorgeous cherry wood you see in the photos. A highly significant but simple upgrade that really makes the room special. 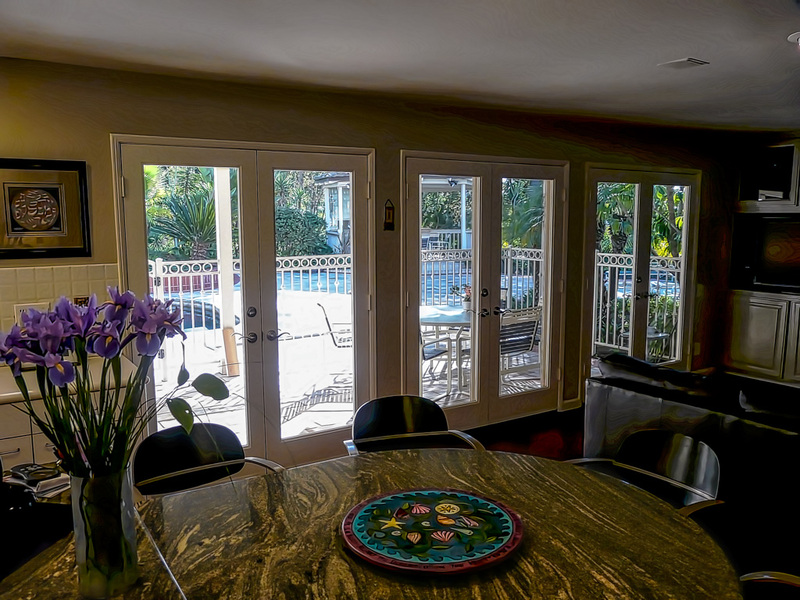 At the same time we did the kitchen, we added all the new french doors and kitchen windows you see, as well as modified the cabinets on either side of the fireplace in the family room before they were painted. Just recently this client had us back to replace the wall ovens, which died. These pictures show the original oven we installed, not the new one. 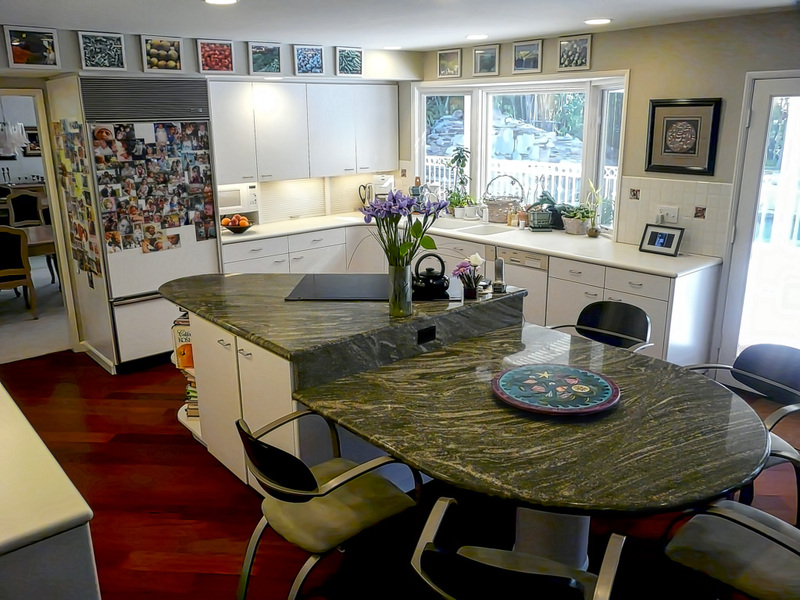 We needed to slightly modify the cabinets doors above and below the oven, but the laminate door, which are still in great condition made it a simple and relatively easy task. Wood doors would have made it far more costly to do the same modifications. This kitchen still has a timeless look because of its simplicity. White is a classic color that is never going out of style. 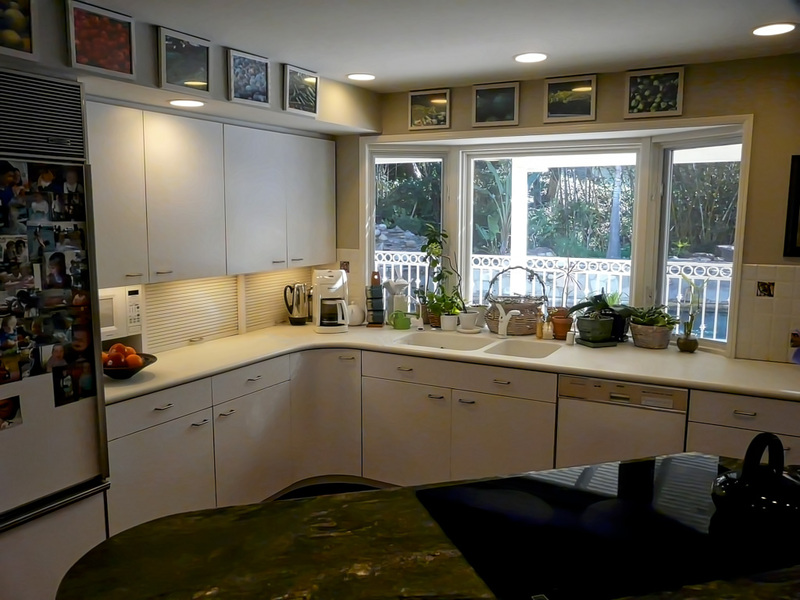 All that is left to update this kitchen is to replace a few more appliances and change the Halogen ceiling cans and undercabinet fluorescent lights to new LED versions.